Uprising with Sonali had me on to talk about my piece for FAIR about the disparity between the media and online polls regarding who won Wednesday’s CNN Democratic Presidential Debate. 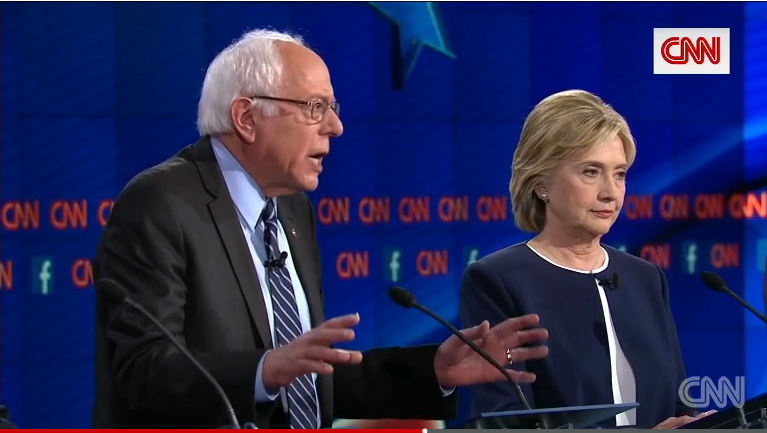 Pundits Thought Clinton Beat Sanders – But Did Viewers? Originally published at Fairness & Accuracy In Reporting. Reposted at Common Dreams. The Times quoted National Journal columnist Ron Fournier (“Hillary Clinton won,” 10/13/15), Slate writer Fred Kaplan (“She crushed it,” 10/14/15), New Yorker staffer Ryan Lizza (“Hillary Clinton won because all of her opponents are terrible,” Twitter, 10/13/15), Red State blogger Leon Wolf (“Hillary was (astonishingly) much more likable and personable than everyone’s favorite crazy socialist uncle,” 10/13/15), pollster John Zogby (“Mrs. Clinton was just commanding tonight,” Forbes, 10/13/15) and conservative radio host Erick Erickson (“I’m still amazed the other four candidates made Hillary Clinton come off as the likable, reasonable, responsible Democrat,” Twitter, 10/13/15). If these so-called “opinion shapers in the political world” declare Hillary the winner, then Hillary must be the winner, according to the Times. What the Times and these pundits failed to mention is the fact that every online poll we could find asking web visitors who won the debate cast Vermont Sen. Bernie Sanders as the winner—and not just by a small margins, but by rather enormous ones.